Isaac and Billy Poe were the best of friends. They went everywhere together. That is great as friends are exactly the kind of thing you want in the small town of Buell, Pennsylvania, a dying steel town. One fatal evening, something happens that will change Isaac and Poe’s lives forever. While hiding out at an abandoned building, Poe gets accosted by a wanderer. Poe and Isaac panic and do everything they can to get away. Issac grabs a ball bearing and throws at the man. The man goes down for good. The police discover the body as well as Poe’s coat at the scene. They arrest Poe but not Isaac. As it stands now, Isaac is only a witness. Without Poe by his side, Isaac becomes a little lost. He takes off out of town. Isaac faces situations where he has to make decisions for himself. Poor Poe what will become of him? 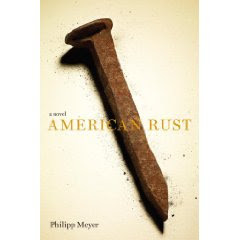 American Rust by Philipp Meyer is a good, heartwarming, simple but enduring story about two friends; who no matter what stick with each other through thick and thin. I predict American Rust will hopefully become a classic, amongst readers. What I found is that Poe was the stronger of the two. He may be quiet but that is because he is a thinker and problem solver. Isaac is the complete opposite. He jumps in feet first to any situation. Along the way Isaac realizes that he needs to start depending more on his brains and does some growing up along the way. Even though at first this book started to move a little slowly for me, once I got further into the story, I found myself enjoying every minute of it. In the words of the famous Edgar Allen Poe, I am happy to say that you will not hear the following words spoken out of my mouth…”Nevermore” when it comes to Mr. Meyer. Wonderful review. I also have this ARC and hope to get to it soon.